Former Minister of State for Government Scholarships in the Office of the President and Cabinet Dr Christopher Mushohwe yesterday bade farewell to 124 students going to study in Russia, China and India under the Presidential and National Scholarships programme. 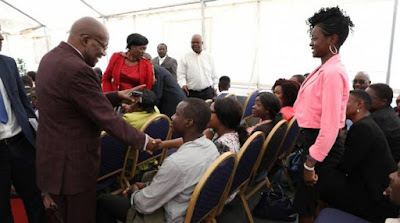 He met the students at a local hotel in Harare and relayed a message from President Mnangagwa, encouraging them to go and acquire the much needed knowledge and facilitate in economic development on their return. Dr Mushohwe said the students were drawn from across the country. “These students here and those we have sent in the past come from every district of Zimbabwe,” he said. In Russia, the students are going to undertake studies in various fields, including Medical Care, Biotechnology, Applied Mathematics and Computer Science, Applied Information Science; and some in the engineering disciplines like Electronics and Nano Electronics, Aeronautical Engineering, Chemical Engineering and Agriculture Engineering. Those going to study in India will focus on programmes like Fashion and Design, Business Administration, Accounting Science and Financial Intelligence. Students heading to China will study programmes like Business Management, Environmental Management and Ecology. Dr Mushohwe said the programmes were important to Zimbabwe. “You can see that the areas we are assigning these students to go and undertake are areas of greater need to Zimbabwe,” he said. “The audit report that was produced by the Ministry of Higher and Tertiary Education, Science and Technology Development on skills gap analysis was quite revealing and these are the areas that we had got wide yawning gaps and we want to fill those gaps. Indian Ambassador to Zimbabwe Mr Rungsung Masakui pledged more support. An official from the Chinese embassy Ms Guo Jing, who represented the Chinese envoy to Zimbabwe Mr Huang Ping, also pledged more support. “Zimbabwe is at a dawn of a new chapter of its development, which gives you great opportunity to tap your potential,” she said. “The knowledge acquired in China will serve as guidance for your work in Zimbabwe towards the target of making Zimbabwe a middle-income country by 2030.